A typical scene in Amsterdam. If you’ve been reading my blog or following me on social media, you probably know that I live in Amsterdam and that I absolutely LOVE my city! One of the best things about Amsterdam is that there’s always something new to see or do, an event or concert to attend, or a new hotel or restaurant to check out. It’s not easy to get bored in this city! 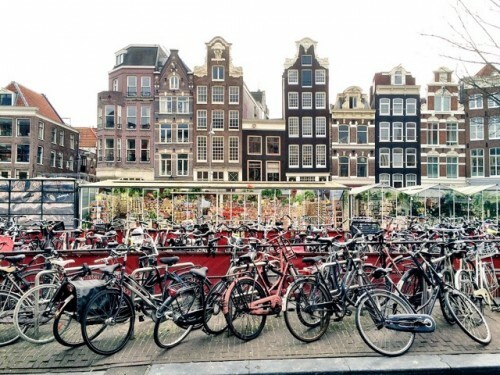 Precisely because I live in Amsterdam, I receive numerous requests every week from my readers about tips for things to do and see, and hotel recommendations. I always struggle when it comes to hotel recommendations, firstly because there are so many options in Amsterdam and more importantly, because I live here and rarely visit hotels. 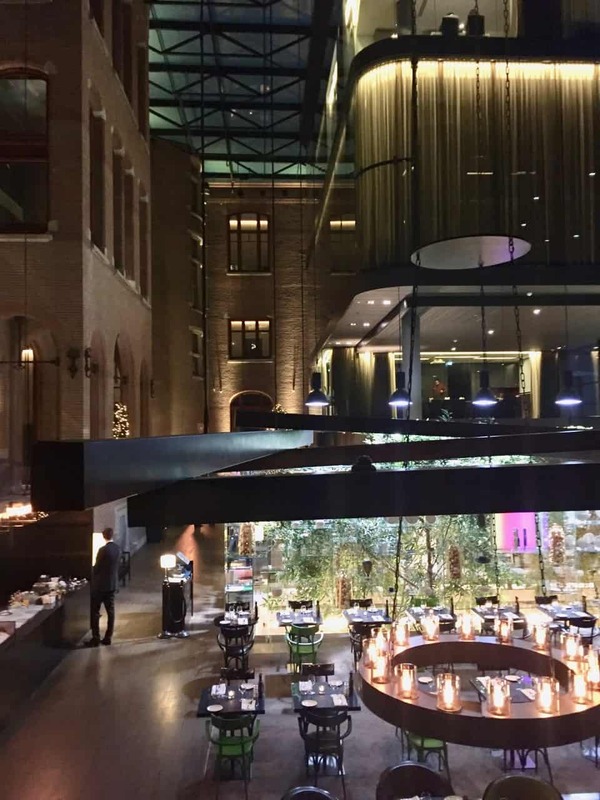 So, when I received an invitation from IAmsterdam (Amsterdam Marketing) to participate in a press trip with a focus on luxury hotels and restaurants in Amsterdam, I didn’t have to think twice! This was a golden opportunity to check out Amsterdam’s five-star accommodation and Michelin-star offerings, and I thought it would be cool to discover my city as a ‘visitor’ (something I recommend doing ever so often). What made this weekend truly special was that it snowed the whole time, creating lots of enchanting winter scenes in Amsterdam! 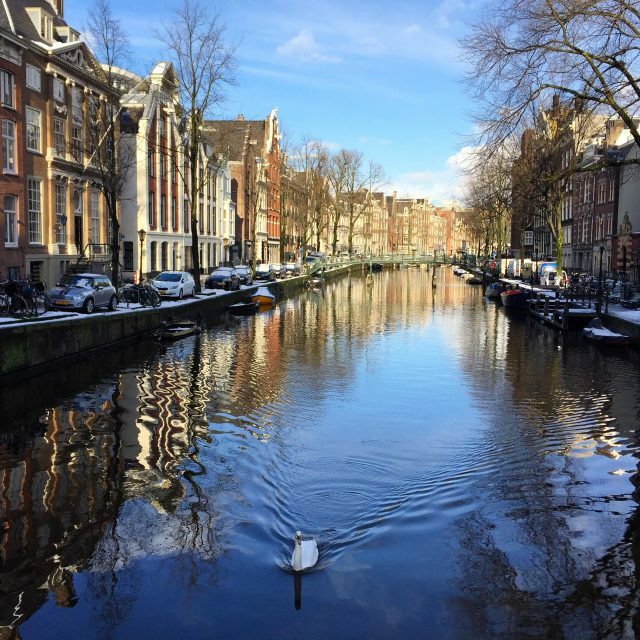 A weekend in Amsterdam… in style! The NH Collection Amsterdam Doelen. I was booked into the NH Collection Amsterdam Doelen hotel in the heart of the city. This historic hotel was built in 1883 and the Empress Elisabeth of Austria (also know as ‘Sisi’) and the Beatles were some of its most famous guests. Another fact I soon discovered: the building was the home of Rembrandt’s most famous painting, the Night Watch, from 1642 to 1715. 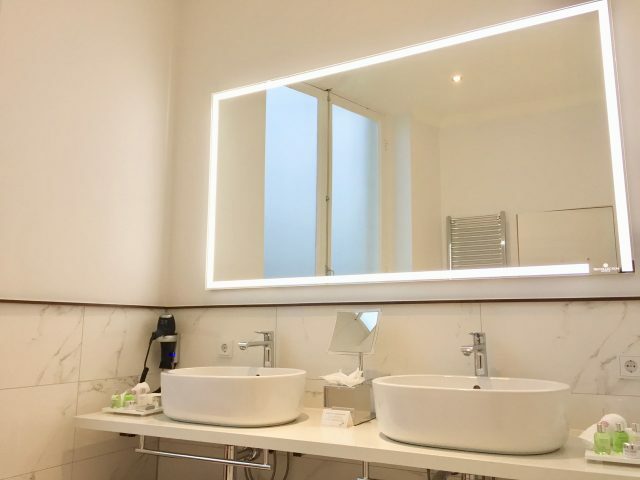 The hotel enjoys a fantastic location, within walking distance of Rembrandt Square, the Flower Market, Dam Square, Chinatown and the Red Light District. I’d passed this hotel thousands of times, especially during my student days (as my faculty is across the road), but I’d never stepped into the hotel. As I entered, I found a smart, cozy lobby. Check-in was swift and I was ushered by the chirpy manager up a grand staircase to my room on the first floor. My room turned out to be a corner suite; very spacious and featured high ceilings coupled with equally high windows. I gasped as I saw the view! A typical Amsterdam canal scene awaited me complete with an authentic drawbridge and falling snow as a beautiful bonus! The gorgeous winter view from my suite at the NH Collection Amsterdam Doelen! I could sit and enjoy this view all day! I was glad I checked in early as this gave me plenty of time to enjoy the suite and the view before dinner! The fabulous bed – I just laid there and enjoyed the view of the snowy canal! The bed faces the large windows. The snowy scenes outside were absolutely magical! There was a writing table and bar/coffee corner in the corridor between the bedroom and bathroom. The bathroom was very spacious, with a separate toilet and shower cubicle. Guests can enjoy views of the Amstel River at breakfast every morning. Check rates for NH Collection Amsterdam Doelen. A five-star dinner tour of Amsterdam! It took a while but I managed to tear myself away from my comfortable bed and join the rest of the press group for a dinner tour. I was really looking forward to it as it was a bespoke tour organised by IAmsterdam to show us a selection of restaurants and hotels. We kicked off dinner with a delicious tuna tataki starter at the Pulitzer Hotel. This famous hotel along the Prinsengracht/Keizersgracht canals consists of 25 historic canal mansions and was completely refurbished in 2016. The lobby of the Pulitzer Hotel. I especially love the bold mix of period and contemporary furnishings throughout the hotel. It was several years since I last visited this hotel so I was pretty stunned by what I saw. The layout was somewhat different – though the maze of corridors that connects the 25 mansions is still there – but what struck me most was the bold mix of the old and new: historic paintings and artefacts next to plush, contemporary furnishings. I loved it! Restaurant Jansz at the Pulitzer. The Pulitzer offers a variety of Extraordinary Suites (themed suites with intriguing interiors) such as the Pulitzer Suite, Music Collector’s Suite, Art Collector’s Suite and my favourite, the Book Collector’s Suite. Check rates for the Pulitzer Hotel. After our little tour of the Pulitzer Hotel, we were ushered into a waiting boat at the hotel’s doorstep. From here, we were brought to our next destination for our main course: De L’Europe Hotel, one of the best five-star hotels in Amsterdam. This canal cruise took us from one dinner course to the next in three different hotels. Along the way, we passed the beautiful Skinny Bridge (Magere Brug) that crosses the Amstel River. We also passed several of the installations of the Amsterdam Light Festival – a festival whereby artists from around the world create light installations along the canals each winter. We disembarked at De L’Europe’s riverside platform from which we quickly made our way inside to escape the freezing cold. This was another hotel I’d not been to in ages and, like the Pulitzer, had recently undergone extensive renovations. We entered the lobby, with its striking red hues, large portraits and chandeliers, and proceeded to the Michelin-starred Bord’eau restaurant, with its beautiful river views. The lobby of De L’Europe. Restaurant Bord’eau at De L’Europe. Chef Bas van Kranen prepared a selection of exquisite dishes. It was such a treat to dine in one of the premier restaurants of Amsterdam! We were treated to a selection of superb dishes by Chef van Kranen. Check rates for the Hotel De L’Europe. After this selection of mains, we were herded once again into the boat for our last journey: up the Amstel River to the Amstel Hotel for our dessert. Check rates for the Amstel Hotel. The Amstel Hotel is another of Amsterdam’s grand dames, counting many celebrities and dignitaries as its guests. We tucked into our dessert as we gazed out over the Amstel River; a fitting end to a wonderful dinner tour of three iconic hotels in Amsterdam! This tour is not available for visitors but this four-course dinner canal cruise comes close. The next day, we made our way to the Rijksmuseum for a private tour. This was actually the first time that I toured the museum with a guide, and I must say, it’s so worth it (especially if you’re not a fan of those audio guides) as I learned so much from the tour: from the architectural details of the building to Rembrandt’s techniques. The Rijksmuseum is one of the most popular attractions in Amsterdam. The entrance foyer of the Rijksmuseum. Our guide explaining the clever use of light in Rembrandt’s iconic piece: the Night Watch. One of the most famous pieces by Vermeer. After our tour, we had lunch at the beautiful Rijks restaurant adjacent to the Rijksmuseum. Our three-course lunch, consisting of scallops in coconut, glazed beef cheeks and roasted pineapple with ginger and liquorice ice-cream, was superb! The scallops as a starter. The beef cheeks main course was exquisite. And we finished off with a delicious pineapple dessert. After lunch, we strolled through a blizzard across the Museumplein (square). Despite the snow, there were quite a few people skating in the ice-rink and it was an incredible sight to see! The ice-skating rink is a favourite amongst both locals and visitors. The iconic Rijksmuseum provides a stunning backdrop. 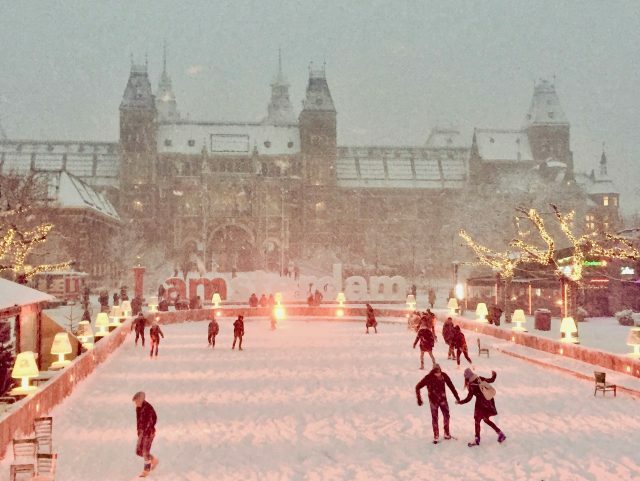 The ice-skating rink at the Museumplein (square) looked gorgeous in the snow! We continued across the square, past the Van Gogh Museum, to the Conservatorium Hotel. This hotel, as I soon discovered, is a terrific addition to the luxury accommodation scene in Amsterdam. The building was previously the Sweelinck Conservatorium (music institute) before it was re-modelled into a hotel in 2008. It was my first time in this hotel and I must say, the Italian architect did a marvellous job in re-purposing this stunning building in the Museum district! 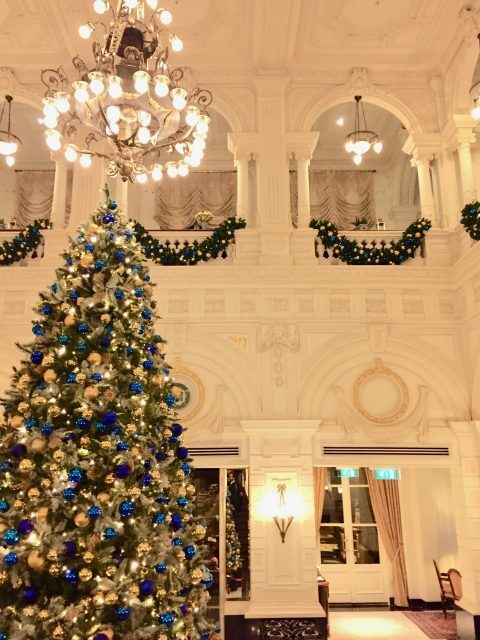 The original architecture blends so seamlessly with the modern designs, and as I strolled around the hotel, there were so many details that caught my eye. We dropped by at the Tunes Bar for a few G&Ts and sushi. Gosh, what a treat that was! G&Ts and sushi at the Tunes Bar. Check rates at the Conservatorium Hotel. a unique brand of grand! I was having a wonderful time tucking into the sushi and sipping on my G&T but it was soon time for our next stop: the Waldorf Astoria Amsterdam! It was a pretty punishing schedule but I wasn’t complaining! Haha! The Waldorf Astoria is one of the newer additions to the Amsterdam five-star hotel scene. Located in a string of historic canal-side mansions along the Herengracht (off the Rembrandt square), this hotel exudes a unique brand of grand! Upon entering, I was struck by how elegantly-dressed the staff were – I later found out that they wear designs by Jan Taminiau, a prominent Dutch fashion designer who also dresses the Queen of the Netherlands! The foyer, like the entrance, was beautiful but quite unassuming. The private dining/meeting rooms, on the other hand, were undeniably stately, whilst the rooms and suites had a cozy ambiance. I loved how the designers preserved the historic character of the mansions while cleverly blending in contemporary influences to achieve a luxurious yet ‘homey’ feel. One of the historic private dining/meeting rooms at the Waldorf Astoria. The Michelin-starred Librije’s Zusje restaurant at the Waldorf Astoria. A suite at the Waldorf Astoria Amsterdam. We were led into one of the stately private rooms where we tucked into a superb three-course dinner. The main course featuring pheasant with a cocoa sauce was terrific! Pheasant with a cocoa sauce. Check rates at the Waldorf Astoria. I returned to my hotel that evening and simply gazed out the window. That view was so mesmerising! I just loved the view from my room at the Doelen Hotel! The last morning of the trip kicked off with a guided tour of the Van Gogh Museum. My last visit to this world-famous museum was more than twenty years ago (!) so I was excited to see it again. This was, however, my first time on a guided tour of the Van Gogh Museum. The guide took us through the different periods of Van Gogh’s life and illustrated how each period impacted his work. I thoroughly enjoyed the tour and I can definitely recommend it! Photos are only allowed in designated parts of the museum, such as this photo wall. We made our way to our last meal on this trip: lunch at Bridges, a Michelin-starred restaurant in The Grand Hotel Amsterdam. On the way, we spotted this swan floating by in the canal. Sure was a gorgeous sight! 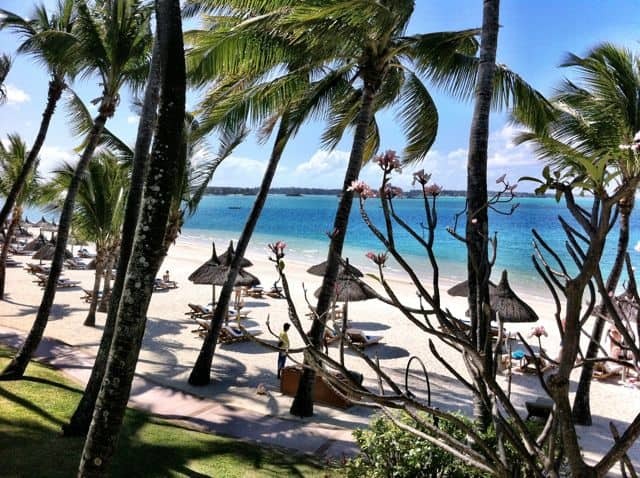 The restaurant is famous for its exquisite seafood dishes, and rightfully so! After several amuses, we were served scallops with elderflower capers, marinated apple and cucumber, and an elderflower sauce; an absolutely stunning dish! This was followed by a divine corvina (a type of seabass) with grilled cauliflower and cauliflower couscous, creme of sprouts and an almond beurre blanc. Not only was the food simply superb, I loved the way each dish was presented – the arrangements and the plates were works of art! The sommelier creates her own wines in South Africa and they pair perfectly with the seafood! The fried scallops were delicious! The corvina was sublime and the plating was simply a work of art! Check rates for The Grand Hotel. I had a fabulous time checking out the luxury hotels and restaurants in Amsterdam. If you’re visiting Amsterdam and looking for some indulgence, check out the hotels and restaurants described above. I’m sure you’ll enjoy the experience as much as I did! Read about how I spent my birthday weekend in Amsterdam. Note: my trip was organised by IAmsterdam, however, all opinions expressed above are mine, and mine only.